School starts in Newcastle tomorrow. 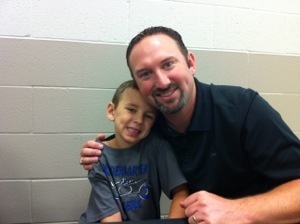 This time last year I was walking Trey into his first day of kindergarten (see picture below). The end of September will mark one year that we have been walking through this journey. It truly is amazing how fast time flies. While I am excited for my other children to begin a new chapter in their lives tomorrow, there is still a void not having Trey here to get ready for his first day in what’s supposed to be 1st grade. Emily’s dad is staying with Trey tonight because Emily and I both wanted to be here for our children’s first day back to school…so tonight, at back to school night, we went to meet our kids’ teachers. Emily went in to meet Trey’s teacher, and the minute she saw his desk, she broke out into tears. It was just hard to see his little desk, knowing he may not get to be there this year. Only the Lord knows. Trey’s teacher hugged Emily and said she would help us keep him up however we needed. We are very grateful for such a supportive school system. Anyway, we are still awaiting the ever important results from the flow cytometry test. We hope to hear something tomorrow. We are believing with all we have that the bad cells will be down!!! Please Lord!!! We prayed with our other children about that tonight and we were all in tears and agreement that we believe the Lord will knock those bad cells down. So, tomorrow will be met with mixed emotions. We are so thrilled for our other children, but still grieve Trey is not here with us. We know the Lord has a special plan for him though…and we believe all things will work for good. I hope to post very good news tomorrow. Emily will be heading back to be with Trey and he is supposed to get Campath again tomorrow. Please pray he handles it better for Emily than he did for me last time. We continue to need and appreciate your prayers. May God do the miraculous every day in Trey!!! Oh Lord, heal him and being him home to us!! !